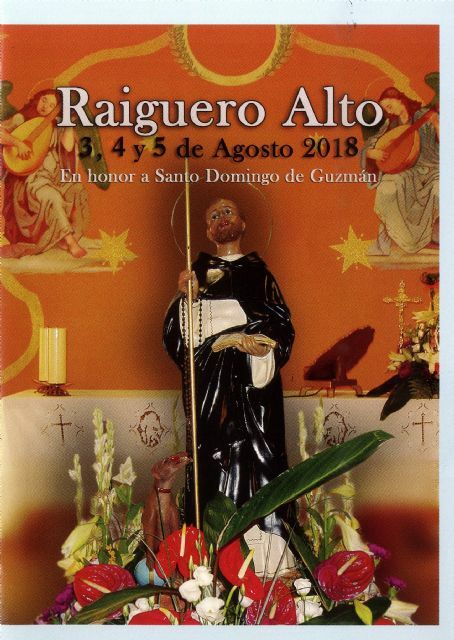 The parties of the deputation of El Raiguero Alto, in honor of Santo Domingo de Guzmán, are held this weekend, from 3 to 5 August, organized by the Commission of Celebrations of this parish and with the collaboration of the Department of Celebrations of the Totana City Council. The program begins on Friday, August 3 with the opening of the beach bar (10:00 pm) and will continue with the Night of Migas (22:30 hours), so that participants will be given oil, flour and a gift for each skillet. From 23:00 hours, the musical performance of the "Gala Dúo" will be celebrated. and at 23:00, the one of Juanma Guzmán, winner of the television program "La Voz Kids-Menuda Noche". Already at midnight, the humorous performance of the "Show San Miguel" will take place and, at dawn, chocolate for the attendees. and in the afternoon, at 7:30 p.m., the Holy Mass will take place and then a solemn procession with the patron, accompanied by the Paretón Musical Group. 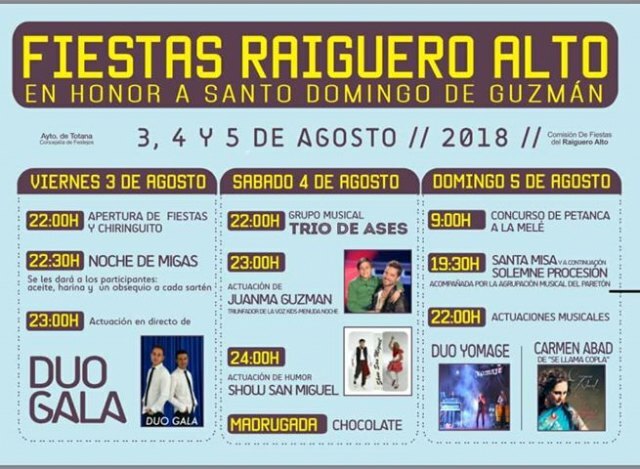 The festivities will conclude at night, starting at 22:00, with the musical performances of "Duo Yomage" and Carmen Abad's copla show, respectively.